I dwell in possibility. 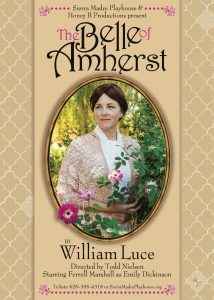 When I was 16, I saw “The Belle of Amherst” by William Luce and fell in love with the play and with Emily Dickinson. I hoped one day to play the role and that day has come! Excited to announce that I am co-producing with Sierra Madre Playhouse and starring in this lovely play next March-April! I look forward to sharing the journey with you!